Dr. Richard Cockwill has known that he was going to be an upper cervical chiropractor since he was 14 years old when his aunt married a chiropractor from Vancouver, Dr. Albert Berti. Uncle Al proceeded to correct the family's spines. Young Richard was impressed. He not only experienced a cessation of his own the spinal problems, but also his father's intractable headaches were apparently cured. Richard enrolled at the Canadian Memorial Chiropractic College (CMCC) in Toronto in 1981. At the time, CMCC was the only chiropractic college in Canada and only taught the full spine manipulative technique that is typically employed by Canadian chiropractors. He was in the unique position of being able to judge the relative merits of both forms of chiropractic. Upon graduation in 1985, Richard trained for with his uncle and mentor in Vancouver. 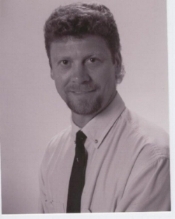 He then moved to the Island; he has been practicing upper cervical chiropractic in Courtenay since 1987. Richard has been a member of the National Upper Cervical Chiropractors Association (NUCCA) from 1982 to 2000 and served on the board of directors for six years. He was also a member of the Academy of Upper Cervical Chiropractic Organizations (AUCCO) for ten years, and president for five. He was one of the founding members of the College of Upper Cervical Spine (International Chiropractors Association diplomat program). He has lectured and written on upper cervical neurology and general upper cervical procedures, and has developed instruments and equipment to aid in the structural correction of the spine. Richard enjoyed participating in a number of sports until his orthopedic surgeon informed him that he no longer had any ligaments holding his knees together. His hobbies include fishing and boating. Upper cervical chiropractic is his passion and his life. He hopes that his legacy will be that the world will have a better understanding of the importance of spinal alignment and balance, and of the important role that the upper cervical spine plays in humanity's health. Dr. Franchesca Lee was born and raised in Calgary, AB. Growing up as a first-generation Canadian-born Chinese, she always knew she would join one of the Chinese culture's three favourite professions: engineering, medicine or law. What Franchesca didn't know was that alternative health care, rather than traditional medicine, would become her calling. She first became interested in chiropractic when her mother began visiting a chiropractor after a car accident. At the time, Franchesca was completing her Bachelor of Science degree in General Biology at UBC . By 2001, Franchesca enrolled at Palmer College of Chiropractic in Davenport, Iowa, known in the chiropractic community as "The Fountainhead" or the First School of Chiropractic. There she was exposed to multiple full-spine manipulative techniques and was also introduced to specific upper cervical techniques. In 2002, after she suffered her sixth motor vehicle accident, her professor of microbiology, also a strong upper cervical supporter, suggested she try the National Upper Cervical Chiropractors Association (NUCCA) technique because she suffered from daily headaches. Conventional chiropractic was not helping her recover. Franchesca began by needing multiple full-spine adjustments per day, with little pain relief. She ended with being able to hold her upper cervical adjustments for weeks at a time and being headache-free. The efficacy of upper cervical treatments in her own health care, along with the mathematical and scientific principles behind NUCCA, convinced her that this would be her technique of choice. Franchesca graduated in 2004 and has practiced in Toronto, Vancouver, Calgary and Edmonton. She has now settled in Campbell River and has long-term plans to stay on the Island permanently. She has been a member of NUCCA since 2004 and is currently working on her Functional Medicine Diplomate. In her free time, she loves spending time outdoors with her husband and dogs, paddling dragonboats and outrigger canoes, cooking, reading and quilting.